Though many national teams don some combination of white, red, and blue on their kits, none are more successful or more respected than France. For France, these three colors are the crux of their national identity, along with the Gallic rooster on their logo and the Les Bleus nickname. Throughout their rich history, they’ve won two World Cups and two European Championships. Most of their success arrived in four distinct eras: the ‘50s, ‘80s, late ‘90s, and late ‘10s. 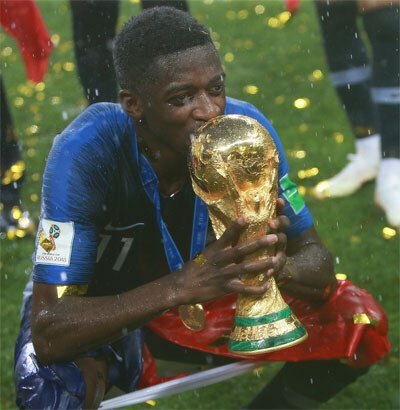 Ousmane Dembélé with the FIFA World Cup Trophy. The France national team was officially founded in 1904, shortly before FIFA’s foundation in the same year (they had, however, participated in the 1900 Olympic Games and won a silver medal). They played their first official match against Belgium in Brussels, securing a 3-3 draw. The following year, they played their first home match at the famous Parc des Princes, defeating Switzerland in front of close to 500 fans. This was followed by a couple of heavy losses, including a memorable 0-15 defeat to England in 1906. Early on in its history, France struggled with identity issues. Most of these issues were the product of a disagreement between FIFA and the USFSA, the main sports union in France. These disagreements came to a head just before the 1908 Olympics, resulting in FIFA and the USFSA sending two separate French teams to the competition. Both teams were eliminated by Denmark, with France A (controlled by FIFA) losing 1-17 and France B losing 0-9. Later that year, the CFI (French Interfederal Committee) intervened by stating that FIFA would be responsible for the national team from that point onward. After failing to reach a satisfying agreement, the USFSA eventually disbanded, becoming semi-affiliated with the CFI in 1913. Six years later, the CFI transformed into the French Football Federation we have today. This newfound stability contributed to some promising showings, such as a 2-1 victory over England. In 1930, France took part in the inaugural World Cup held in Uruguay. 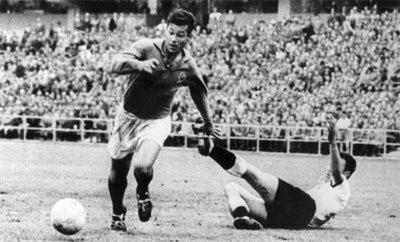 In their opening game, they became the first team to score a goal at the World Cup (courtesy of Lucien Laurent) on their way to a 4-1 victory over Mexico. After losing their remaining two matches to Argentina and Chile, however, France bowed out in the group stage. The 1934 World Cup ended up being another disappointing showing, as Les Bleus were defeated by Austria in the opening round. 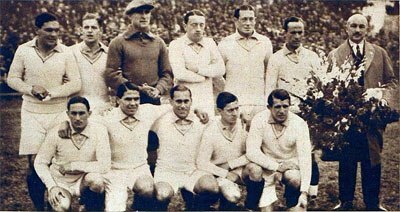 The French IX against Argentina in World Cup 1930. Four years later, France had a chance to go a step further on their home soil. After qualifying to the competition automatically, they managed to defeat old rivals Belgium 3-1 on two goals from Jean Nicolas. The quarter-finals match pitted them against defending champions Italy, who came out victorious, eventually defending their title by beating Hungary in the final. Due to WWII, this was the last World Cup France would have a chance to compete at for a while. France’s first “golden generation” arrived during the ‘50s. Led by creative dynamo Raymond Copa and prolific striker Just Fontaine, they quickly transformed into a team that demanded respect from any opposition. This squad made its debut at the 1954 World Cup, where they were unable to escape from their group after a defeat to Yugoslavia 0-1 in their opener. They finished their tournament with a hard-fought 3-2 victory over Mexico. Willing to prove that the 1954 World Cup showing was just a temporary setback, France cruised through the 1958 World Cup qualifiers. Their good run continued at the tournament proper, as they advanced from the group and defeated Northern Ireland 4-0 on their way to the semi-finals against Pelé’s Brazil. They lost 5-2, but managed to defeat West Germany in the third-place match. Fontaine finished the tournament with 13 goals, a record which still stands today. Two years later, Les Bleus were one of four nations to make it to the final stage of the inaugural European Championship. However, they were forced to play without either Copa or Fontaine, which contributed to a shocking 4-5 loss to Yugoslavia. Despite a 4-2 lead by the 75th minute, France allowed their rivals to score three goals in less than four minutes, knocking them out of the competition. They went on to lose 0-2 to Czechoslovakia in the third-place match. By the early ‘60s, most of the golden generation had retired, which led to a big slump in both form and results. The next major tournament France qualified for was the 1966 World Cup, but going winless in the six friendlies prior to the tournament didn’t inspire much confidence in the team. At the World Cup itself, they finished last in their group, which contained Mexico, Uruguay, and eventual champions England. The following decade saw a streak of subpar results go on, as France failed to qualify for any major tournaments. During this period, the French Football Federation hired and fired managers on a consistent basis, but nothing seemed to produce results. This went on until the appointment of Michel Hidalgo in 1976, as well as the arrival of a talented new generation led by midfield maestro Michel Platini. Following a group stage exit at the 1978 World Cup, France came back with a vengeance four years later. With the carré magique of Platini, Tigana, Giresse, and Fernández bossing the midfield, France cruised to a semi-final match against West Germany. In one of the best matches in World Cup history, West Germany came back from a 1-3 deficit in overtime and won the game on penalties. France then lost to Poland 2-3 in the third-place match. Their great run continued at the Euro 1984, which was their first European Championship in 24 years. This time around, the carré magique was in full swing, with Tigana and Fernández playing as deep-lying playmakers, Giresse on the wings, and Platini behind the striker. Despite some tough competition, France went on to win all five matches at the tournament, securing their first major trophy. Platini’s 9 goals are still a record in the competition. Despite Hidalgo leaving the team after the Euro, France remained a favorite to win the 1986 World Cup. However, injuries to Platini and Giresse -- both of whom played through injections -- dealt a heavy blow to their World Cup hopes. After squeezing past defending champions Italy and Brazil in the knockout stages, Les Bleus again lost to West Germany 0-2 in the semi-finals. With a 4-2 victory over Belgium, they tied their best-ever 3rd place finish in the competition. Upon bringing his playing career to an end in 1988, Platini took over as France’s manager. He immediately added talented youngsters such as Laurent Blanc, Eric Cantona, and Didier Deschamps to a veteran core, but the results were decidedly mixed. After going unbeaten for 19 straight matches and almost three years, France bowed out in the group stage of the Euro 1992. Soon thereafter, Platini stepped down as the team’s manager. The 1994 World Cup qualifiers seemed like a good opportunity to bounce back, especially once the team went on a 7-match unbeaten streak. However, a shocking 2-3 loss to Israel meant that France had to stay undefeated in their last match against Bulgaria, the only team who could catch up with them. They held on to a 1-1 draw until the final 30 seconds, at which point Kostadinov scored a counterattack goal and knocked France out from the competition. After failing to qualify for the second straight World Cup, the FFF turned a new leaf by appointing Aimé Jacquet as the new manager. With Jacquet at the helm and the young Bordeaux star Zinedine Zidane in the team, France easily qualified for the Euro 1996. They went on to advance from the group and knock out the Netherlands in the quarter-finals, but they eventually lost to the Czech Republic in a penalty shootout. As the hosts of the 1998 World Cup, Les Bleus were among the biggest favorites to win the tournament. After coasting through an easy group containing Denmark, Saudi Arabia, and South Africa, France squeezed past Paraguay in the round of 16 on a golden goal from Blanc. They then defeated Italy and Croatia to set up a meeting with Brazil in the finals. With two goals from Zidane and a late finisher from Petit, France clinched their first World Cup title. Though Jacquet left the team on the evening of the victory, France was still in the driver’s seat at the Euro 2000. With Zidane in his prime and a terrifying strike line led by David Trezeguet and Thierry Henry, they had little trouble getting past their group. They went on to defeat Spain and Portugal on their way to the final match against Italy, where they managed to equalize in the stoppage time and steal the victory on a golden goal from Trezeguet. At the 2002 World Cup, France was given a brutal reminder that they weren’t invincible. After failing to score in any of their group matches, they became the second World Cup holder to be eliminated in the opening round after Brazil in 1966. This was followed by another lackluster performance at the Euro 2004, where they lost 0-1 to eventual champions Greece in the quarter-finals. The 2006 World Cup was a chance at redemption, and France seemed intent to capitalize on it. Though they struggled in the opening round, they turned on the switch in the knockout stages by defeating Spain, Brazil, and Portugal. Once again, their opponent in the final was Italy. This time around, however, France was dealt a fatal blow when Zidane was sent off for headbutting Materazzi in the chest. The match went to penalties, with Italy winning 5-3. With Zidane officially retiring, Les Bleus were left without a real leader on the field. This contributed to a streak of disappointing results that followed, including group stage exits at the Euro 2008 and the 2010 World Cup. The Euro 2012 was an improvement, but only a slight one. They advanced from the group, but were unable to put up much of a resistance to eventual champions Spain. Shortly after the Euro 2012, Didier Deschamps took over as the team’s manager. As the former captain of the teams that won the 1998 World Cup and the Euro 2000, Deschamps was expected to bring a winning mentality. His first tournament as manager was the 2014 World Cup, and the early results were positive. France advanced from their group and defeated Nigeria in the round of 16, but lost 0-1 in a nailbiter against eventual champions Germany. The Euro 2016 was another triumph for Deschamps and his increasingly younger squad. As the host team, France demonstrated their mental edge by advancing from a tough group and overturning a deficit against Ireland in the round of 16. They then trashed Iceland 5-2 and outlasted Germany 2-0, but Portugal was too tough a hurdle to overcome. Despite dominating most of the match, they succumbed to an Eder winner in extra time. Two years later, Deschamps’ generation got to face another big test at the 2018 World Cup. Once again, the expectations were high, as they had previously cruised through their qualifying group with 23 points and just one defeat in 10 games. Still, their group showings left a lot to be desired. Following two uninspiring victories over Australia (2-1) and Peru (1-0), their match against Denmark ended in a goalless 0-0 draw. Once again, the knockout stages seemed to feature a completely different France team. After beating Argentina 4-3 in one of the best matches of the tournament, they outlasted Uruguay and Belgium on their way to the finals. Another impressive performance later -- a 4-2 victory over Croatia -- and France became the sixth team to win multiple World Cup titles. With four goals each, Mbappe and Griezmann won the Best Young Player and Silver Boot titles, respectively. 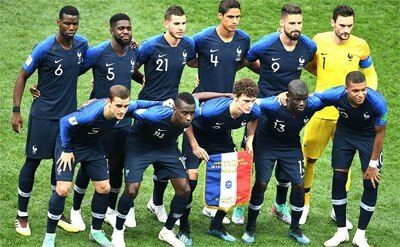 France starting XI in World Cup 2018 final. France has participated 15 times in the World Cup. * France didn't qualify, but was invited since other teams withdraw. They would in the end withdraw themselves given was the amount of travel that would be needed for the fixtures in the group. France have participated nine times in the European Championship (Euro). The logo features a stylistic version of the Gallic Rooster (the Coq Gaulois). The rooster has been depicted more realistic in earlier versions of the logo. The initials FFF stands for Fédération Française de Football. Above six-sided crest, two stars could be seen representing the two World Cup titles.